This versatile Shower-Window Perch has multiple uses as shown in the examples below. The perch is textured, providing secure footing. When not use the perch folds against the wall. The over-sized suction cups attach firmly to smooth, non-porous surfaces and can support heavier birds. This Shower-Window Perch is appropriate for small to medium-sized birds. 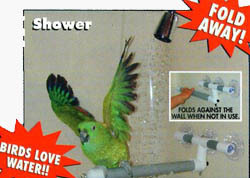 Turn your shower into a tropical rainforest for your bird to enjoy. 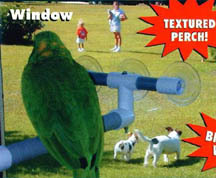 Or let him enjoy watching outdoor activities and nature viewing by placing the Shower-Perch on a window. 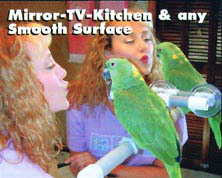 He can even identify and interact with his reflection when the Shower-Perch is placed on a mirror.